StickyPassword is not yet very popular compared to LastPass, TeamPassword, Dashlane, Intuitive Password and yet it has all the features of a Password Manager that makes it one of the best Password manager and more. Sticky password can not only save all your web credential but also your desktop app password. So you can easily forget all of your password and remember just your master password. Other password managers don’t have option to save desktop application password. Sticky Password is one of the easiest password managers. You just need to download and install Sticky Password and it will automatically start configuring all of the browsers for you including Chrome, Firefox, Internet Explorer Browser and some other less known browsers too. Sticky password doesn’t have any web interface hence when you download the software it will ask you to type Master password. Sticky password doesn’t have any way to recover the Master password which is to protect your online credentials so it is essential that you remember your master password always. As someone wise said, “Remember the Master Key and forget all other password”. Sticky Password has two ways to save your passwords, either you can save on the cloud or you can select Wi-Fi only. When you select cloud, your passwords are encrypted and saved to the cloud. When you select Wi-Fi only, your password never leaves your home network, only the devices connected with your home network can fetch the saved passwords. The later option is one of the unique feature of Sticky Password which is loved by the security enthusiasts. After you watch the initial tutorials and install the browser plugins you can start using Sticky Password. 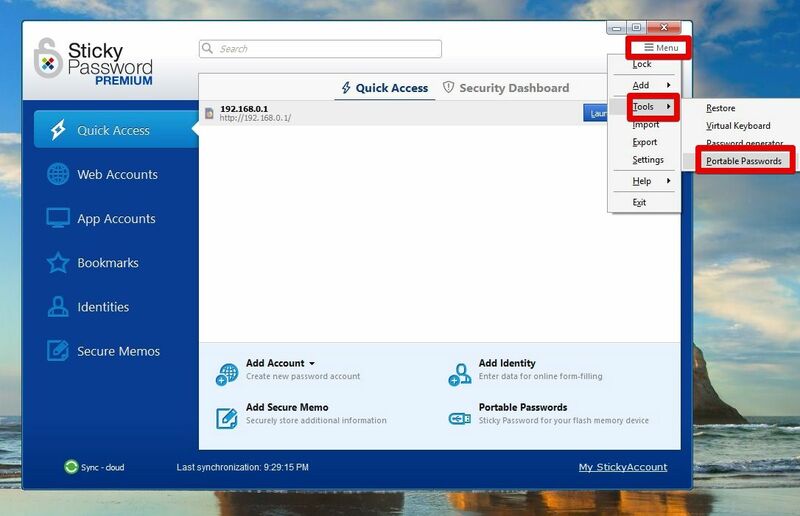 When you first time login on a website, sticky password will save the entered password and from the next login you won’t need to enter the password again. Sticky Password will autofill the password. Sticky Password has two factor authentication which you can use for better security. For only 29.99$ per year you can get the premium version for one years. For TechSpree readers only, you will get 50% discount if you use this discount link (Only 14.99$ per year). Most economical would be to buy the Lifetime package which costs only 74.98$ . Sticky Password is the only password manager that gives you Lifetime package in such a low price. 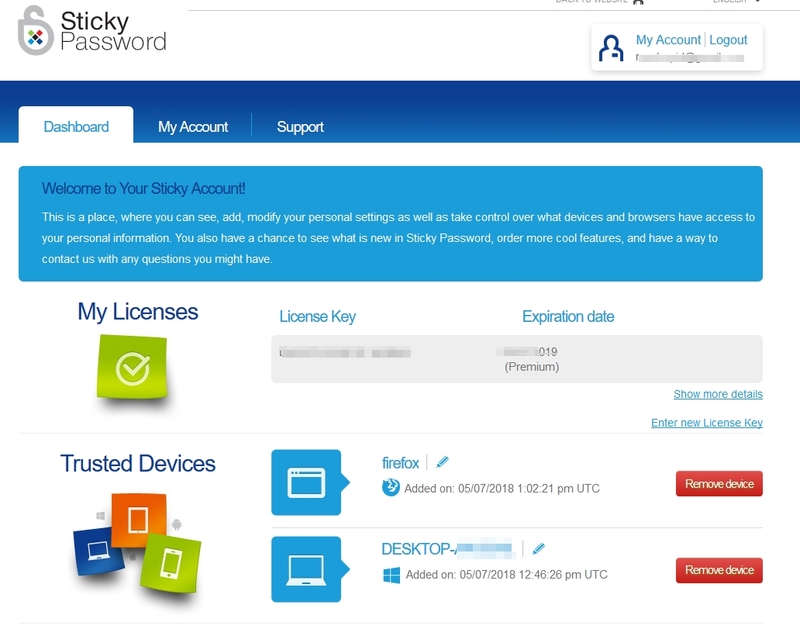 Sticky Password Free allows you to use Sticky Password on a single device. On the other hand, Sticky Password premium allows you to use Sticky password across devices. So you can save the passwords on all of your devices and use the same StickyAccount to login automatically (using either cloud or local Wi-Fi networks). Pay onetime fee and use Stickypassword lifetime. This has 30 day money back guarantee so you have nothing to loose. The cheapest password manager of 2018 is Sticky Password due to it’s lifetime package which other password managers are lacking. Many users worry about renewal price. LogmeIn was only 39.95$ but they decided to change the price to 599$. Lastpass is also acquired by LogMeIn. If you worry about this type of price hike use Sticky Password Lifetime License so you don’t have to worry about renewal price. See below image collected from online forum. Although it supports a wide range of Browsers , it still doesn’t support Microsoft Edge browser. But who uses this browser anyway, right? As you can see, Sticky Password supports a wide range of Operating Systems and versions. So you can use Sticky Password on all of your Computers and Devices which is Super Cool as you won’t have to remember any of the passwords , ever!! I think this is what you have look for in a Password Browser. Don’t let the pale user interface of Sticky Password fool you, it has all the modern features of Password Managers. Sticky Password is super easy to use. First download Sticky Password client on your device. After you install the app, you will be asked to provide your email address and one Master password. Remember your master password. If you have purchased the Premium version you can submit your license key. After installation is complete, the sticky password will close your opened browsers and integrate Sticky Password addons/plugins/extension to all of the supported browser. Then next time you open your browsers you will get the sticky password already installed on the browser. If you are switching from LastPass, Dashlane, RoboForm or Intuitive password, you can always import the saved password from them onto your Sticky Password account during the installation process. Below I will discuss all of the features of Sticky Password so that you can understand and utilize all of the advanced features of Sticky Password. From Quick Access you can see all of the saved passwords. You can click on the Launch button to open the site on your browser. From the Security Security Dashboard tab you can verify if your passwords are strong enough or not. Sticky Password analyzes your password and let you know the weak passwords which are vulnerable to “Bruteforcing” attack (automated software guesses your password by using a pattern). Also reused passwords will be flagged. It is recommended to use different passwords for different accounts. Sticky Password App accounts let you save your password for Desktop application like Skype, Outlook, iTunes etc. From the menu you can also browse and show other apps to integrate with Sticky Password. After you add the app, you won’t need to enter password again to login into the app accounts. This unique feature of Sticky Password is super useful for the users. Sticky Password identites allows you to save all of your details from your personal details like your Firstname, Lastname, email to your business information like your company name, position. Also it can save your credit card and bank account details from the finance info menu. From internet info tab you can select your security question and answer. Please note that, all of these info will be used to autofill forms. So, after you enter these information you won’t need to type in your personal details on any site. This is the time saver and useful if you don’t want to waste time typing the information for every sites. Sticky Password Secure memo lets you save information securely. It is just another saving note option only this one is secure. You can save any type of information like your software license, passport information. ID card information etc. Sticky Password lets you generate very strong password that will be hard to crack. To generate new password, go to Menu –> Tools –> Generate Password. Click on the Generate Button and then click on the “EYE” icon. You can also copy the password into your clipboard. After that you can paste the password on the web page where you are creating new account. Now as this password is very hard to remember let Sticky Password save the password for you and next time you login it will automatically type the password. So you get hard password without need of memorizing the random strings and characters. Sticky password can also rate your existing password. 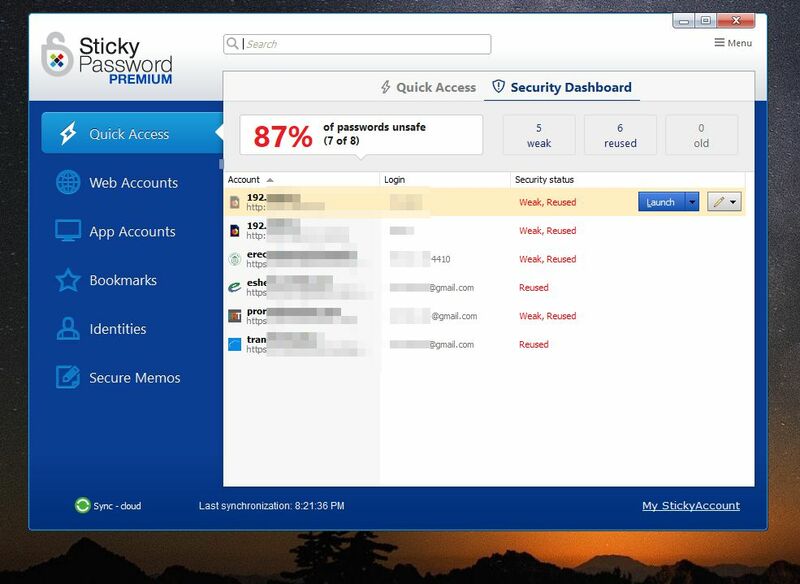 We would recommend you to change the password flagged Weak by sticky password from Quick Access -> Security Dashboard. Using a strong password and generating unique password for each site will protect your from both Bruteforce attack and Password leaking (if you use same password on every sites, one hacked database can reveal your password and attackers may login to your other sites using the same password). Sticky Password has USB drive or Bluetooth device authentication. If and only if the selected USB drive or Bluetooth device is connected it will override the master password. This is not true two factor authentication though. Sticky Password Android and iOS app lets you utilize fingerprint for authorization. From PC or Mac you can use your mobile’s OTP that is changed every 30 seconds to authenticate each login. But what interesting is that Sticky Password supports iris-recognition biometric of EyeLock’s myris device which is a costly device. Portable Password option can be accessed from Menu –> Tools –> Portable Password. By using this option, you can save all of your password to a thumb drive or Portable HDD in a portable Sticky Password app. You can use this USB based app to login to saved sites just like regular Sticky Password software. Remember, all of the future passwords will be saved on the USB drive and not synced with the cloud account. RoboForm, KeePass, and others also has portable saving options. Sticky password is available for iPhone on AppStore and Android on Google Playstore. I tried StickyPassword on my iPhone and could attach my Touch ID with it. For mobile edition, you can either use the Sticky Password proprietary browser or any other browser like Safari or Chrome. If you don’t use Sticky Password built in browser then you will have to copy paste credentials. As per Pete from StickyPassword , the team is already working on the password sharing option. In the meantime, You are advised to login to the account under your your Sticky PasswordID and save the account in the database when prompted. Sticky Password is all-in-one Password Manager with Password saving, syncing, autofill, App Password management, Multiple device syncing, Password Generator, password rating and weak password detection etc. feature made it one of the best Password manager of 2018. Sticky Password has USB drive, Bluetooth device as authentication method to replace your master password,Sync via cloud or Local Wi-Fi and an attractive one time payment feature that makes it perfect alternative to LastPass, DashLane, TeamPassword or Intuitive Password manager.